Everything you Wanted to Know About Protein and More! A protein is a chain of amino acids. It may range from twenty units to tens of thousands. Every type of protein has a unique sequence of AAs. That’s great, but now I don’t know what an Amino Acid is! AAs are the basic building blocks of protein. AAs are acid at one end and alkaline at the other, as these two elements attract, AAs readily form head-to-tail chains of whatever length. There are eight essential AAs. Essential AAs are those AAs that the body cannot produce by itself and must take in through food. AAs are also important because they contain nitrogen. What’s nitrogen and why should I care? All macro-nutrients (protein, carbohydrates and fats) contain carbon, hydrogen and oxygen. Only protein contains Nitrogen. Your body needs the nitrogen in amino acids from protein foods to make the other amino acids it uses to synthesize human proteins. Not only do your various tissues contain protein, your metabolic processes depend upon enzymes, all of which consist of various kinds of proteins. The nucleic acid DNA, which makes up your genes, and RNA, which is involved in protein synthesis, also contain nitrogen. Okay thanks for the science lesson, on to the practical. What happens to protein that’s been cooked? All protein has a definite shape in the chain of AAs that constitute the protein. When you cook a protein you change the shape of this chain in a process known as denaturing. For example, prior to cooking, an egg white is liquid and transparent, whereas afterward it is hard. The egg white has been denatured. Get it? If you denature protein it alters the shape, but not the amino acids it is made up of. Generally speaking denaturing is safe as it kills off unwanted bacteria. Just don’t overcook the protein, it’s not tasty or good! Something I think we can all agree. Why do you need air? Protein is a vital fuel for the body for a number of reasons. Hair and nails are mainly made of protein. Your body uses it to build and repair tissues. Protein also makes up enzymes, hormones, and other body chemicals. 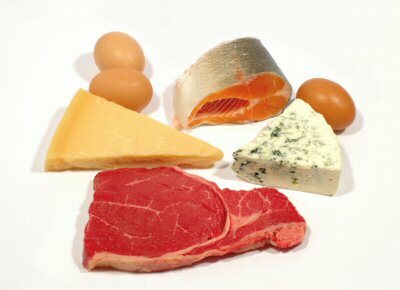 Simply put, protein is an important building block of bones, muscles, cartilage, skin, and blood.